Audio Fidelity Stereodisc 5903. Leon Berry at the Giant Wurlitzer Organ. 1957 LP. 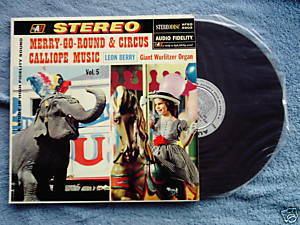 Merry-Go-Round and Circus Calliope Music, volume 5. Tracks include Take Me Out to the Ball Game, In the Good Old Summertime, Mockingbird Hill, Who, Tupelina, Tulips from Amsterdam, Play Hurdy-Gurdy. Berry plays a three-manual Wulitzer pipe organ installed in Chicago's Madison Skating Rink. Vinyl is VG/VG; cover with vintage photos and liner notes is VG with some ball point ink writing on reverse, cover also has minor corner wear and small stain on back right-hand corner.